Get a better Car with #QuikrNXT! I first came to know about Quikr when my friend told me his experience of buying a double bed from this website. He was all smiles while he animatedly told me how easy it was to buy things from Quikr. Intrigued I went to the website and was wowed by it! Now with Quikr NXT which has a new chat option added it has become easier to contact the right people, ask for more details and only buy the product when you are satisfied. Since the past few weeks, I have been thinking about upgrading my petrol Maruti Alto with a diesel hatchback and this time, I want to go for more comfort and have decided on checking out for second hand Hyundai i20. With this in my mind, I knew where I had to go for all my buying and selling needs. Typing the url to Quikr : http://www.quikr.com/ , I was soon at the home page and eager to start on my search! Now, before I start with my story of how I went and searched for options, let me tell you why I love Quikr NXT and why I recommend it to you if you are thinking of getting a new car. 1) Our private information stays private and the danger of it falling into the wrong hands is now netralized. 2) We can chat with the buyer/seller at our own convenience without compromising our own work and fretting on disturbing the other person by calling again and again. 3) We can chat until all our doubts are cleared and only the buy the product when fully satisfied. 4) Photo sharing is also available which helps us in checking the product with real time pictures. 5) A record of our conversation is there so we don't have to remember what was promised or what we promised. We can just check the previous chats and recount what we talked about! 6) Quikr NXT is available on desktop, mobile and by app. It's free and easy to use. 7) No more fake calls and fake sellers. Only genuine people will reach us. Now the above reasons are assuring and had me hopping over to Quikr to start my search for a new car! 1) I reached the home page of Quikr, selected my city and selected the category: Cars to start my search. 2) To refine the search further, we have options like Brand Name, Model, Price Range, Year, Fuel type, New/Used, Ads posted in, Posted by, Locate din etc. I was surprised to see many options flood the screen. Searching through the available options, I selected one and there was a "Chat Now" button beside the particular ad in green which allows us to chat with the seller directly without having to make even a single call! I clicked on "Chat Now" and a pop up window opened where I could enter my question for the seller. Simple! Now this is one cool feature. I sent my question to the seller and so started our chat which works normally like any other chat. I even asked for some new pictures of the car and inquired some more. Although, I am still checking out the car and have not finalized the deal, I am happy with my experience and wanted to share it with you. If you are thinking of upgrading your car and are looking for a better one then checkout Quikr and enjoy Quikr NXT. You wont be disappointed! This post is my entry for Indi-Happy Hours by Indiblogger in association with Quikr NXT. Welcome to Nevaeh— a world where technology no longer exists, but magic does. Long ago, the violence and radiation of the terrorist wars killed America. Those left dwell in a world of ritual and magic where ten dominions struggle for supremacy and a dark power rises to claim all. Areenna, the only daughter of the King of Freemorn, is barely eighteen, yet her psychic ability is strong. She is summoned to ‘The Island’ and learns that the fate of her world is in her hands. She must undertake a perilous journey to save Nevaeh from destruction. But she will not travel alone. Mikaal, the son of the High King of Nevaeh, has as much at stake as Areenna. Their quest takes them through haunted wastelands filled with mutants while an evil force does everything in its power to stop Areenna and Mikaal—for it wants Nevaeh as its own. This book has astounded me. For one, this genre is not my cup of tea. Although I love science fiction, I’m not a big fan of fantastical worlds, especially when a medieval type of life is involved. Yet, this book has been a delightful surprise for me. David Wind has created a world that expresses magic in every way; not just with the sparks and orbs of light that are expelled into the air with every wave and flick of the youngsters’ hands, but also with the suitably old-fashioned dialogue and the masterfully described scenes of the magnificent landscape. This amazing future world is simply irresistible and as I read on, I felt suitably mesmerized by it. I’ve had the best ‘mind trip’ of my life in years with this book. A true gem of its genre. Well done, David Wind! I’m already looking forward to the next book in the Tales of Navaeh Series as to see what else this highly imaginative author has in store for the reader. "A dystopic fantasy with a feminist twist! David Wind's first bovel was published in 1981 and he has published thirty-five novels of Science Fiction, Mystery and suspense thrillers. He lives and writes in a small village about thirty miles upstate of NYC, and shares his house with his wife, Bonnie and dog Alfie. In 2008, David published his first Indie book, Angels In Mourning, which won the Amazon.com Book of the Month Reader's Choice Award. His Historical Fantasy, Queen Of Knights, reached #2 on the Amazon.Com bestseller lists for historical fantasy and medieval fantasy. In 1988, David was honored by science fiction writer and Hugo Award Grand Master Andre Norton, who, after reading Queen of Knights, asked David to write a short story for inclusion in her 'Andre Norton's Tales From The Witch World 2' Anthology Series. David also wrote the novelization of the ABC 7 day miniseries, The Last Days Of Pompeii. 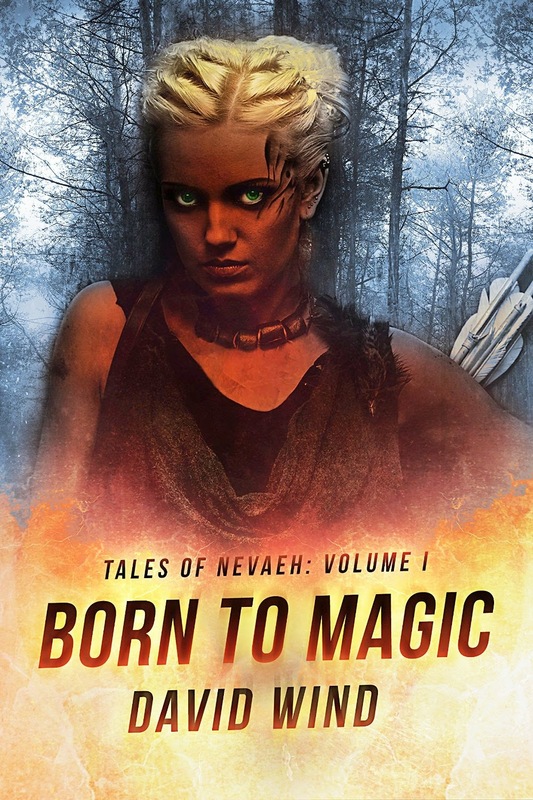 David is currently working on a new sci-fi/fantasy series, Tales Of Nevaeh. Volume I will be released in February of 2015 and Volume II will be out in the late spring. The most essential factor is persistence-determination never to allow our energy or enthusiasm to be dampened by discouragement that must inevitably come. My Bedtime Rituals for my kids! Babies are sweet, cute, bubbly and a joy to our heart. Their endless energy and boundless happiness makes our day but when these same happy bundles are unhappy, it squeezes our heart. We are ready to do anything to see them smile again. Our lives revolve around them. Getting them to sleep is a real task, they refuse to sleep, have erratic timings and are frequently wetting their nappies. I remember the days when my kids were babies. It used to be so difficult to get them to sleep. We were forever trying out new things to tire them out so they would sleep easily and get their much required rest because when they were not well rested, they threw tantrums, were jumpy and generally unhappy all day. So with trial and error, I and my wife had set a bedtime ritual for our babies which started out with a good body massage and then a nice warm water bath where we would let them play in the water for sometime to tire them further. Then pat them dry and dress them in their soft night clothes which they loved. At that time, we didn't have diapers like we have today and I have seen how great they are. Pampers Baby Dry Pants is one such very useful and comfortable diaper for babies which keeps them dry all night long and the best part is that it stays dry not only on the outside but also on the inside, making the babies comfortable and safe from getting rashes which are very painful. They are easy to wear because they can be worn just like pants and I have seen how happy they make the kids. My niece has a small baby and we often visit them. She uses Pampers for her kid and the cute bundle of joy is so happy, crawling everywhere. He is so quick that we have to run to grab him. My niece told me how she had started out with cloth diapers, fearing that any other diapers would make the baby uncomfortable and prone to getting rashes by sitting wet in it all day but she quickly realized that cloth diapers were very troublesome. The baby was urinating frequently and each time that happened the floor, bed, cradle etc. got wet and the baby was left howling so she went to the store and bought Pampers Baby Dry Pants after a recommendation from the store keeper. She is very happy now and cant stop praising Pampers! The baby is dry, happy and most importantly, comfortable in these diapers. I and my wife used cloth diapers because we had no other option and so had to check on the kids frequently and change them whenever they got wet. We used plastic sheets beneath the normal ones to save the mattresses but this got the babies very uncomfortable. But we had to do this. My kids were a happy lot and as soon as we laid them in the cradle they would grab their toys and wait for my wife to sing their favourite lullaby to them. Their cradle was also selected such that they were comfortable in it and liked sleeping in it. Sometimes we read them stories too but mostly it was the lullaby that had them sleeping peacefully. I miss those days with their constant laughter, their innocent tantrums and their smiling faces as they slept lost in their own dreamworld. What are your bedtime rituals for your babies? This post is written for Indi-Happy Hours on Indiblogger as part of Bedtime Rituals from Pampers Baby Dry Pants. When a baby is born, the soul is very pure and so is the body. Soul always remains pure but the body and mind face a lot of challenges in Life, right from going to school, then college, then searching for a job and getting the right one, then getting settled well in Life to getting married with the right partner. If all this is met, then a new cycle of Life begins with a new born baby in one’s life and this cycle continues till the body attains the state of death. In between, we suffer with so many other challenges like maintaining the right mix of relations with our family, friends, colleagues, children, neighbours, shouldering social responsibilities etc. which are sometimes compromised due to one or the other reasons. When IDBI came up with the scheme of Insurance Whole Life – Befikar, Umar bhar – it gave me the opportunity to re-think about the whole Life I was leading and the one I had dreamed of ! Some dreams were fulfilled, some were compromised and some still unattended. So now I can live the Life I had always dreamed of – Befikar Umar Bhar, credit goes to IDBI. 1. Spending Full Time with my Family and Maintaining Relations : In the course of my service, I could not give much time to my family which I always regret. If I am given the opportunity of Befikar Umar Bhar, I will definitely enjoy more time with my wife and children to keep them happy and feel my presence altogether. I would also improve my relations with colleagues, friends, neighbours etc. as now my mind will be relaxed and calm and I can contribute in a positive manner to maintaining my relations with my family and the outer world. 2. Leading a Healthy Life : I can invest my time in fulfilling my desire of joining a gym for a better state of health which will enable me to stay fit. I can do exercises of my choice in the gym. I had always dreamed of having a well-built body which I can now achieve. 3. Fulfilling my dream of travelling the world : I have always dreamed of travelling around the world. Now I will plan with my family to go to beautiful places in the whole world, will enjoy the stay at beaches, will experience all types of rides, have fun feeling the splash of water on my face without any fear that I don't know how to swim. The comfortable stay and well planned journeys will make my day and my body and mind will feel a new height of relaxation, making the whole trip enjoyable and memorable for years to come. 4. Serving Society : Being Befikar in my Life, I can accomplish the work which I always wanted to do for the society. I will contribute my time to making our place clean by participating in "Swachh Bharat Abhiyan" and making people around me aware of how they can make the cleanliness a big and affordable challenge by participating themselves and by encouraging others to join and make it a habit. Apart from cleanliness, I will spread the awareness of education among poor illiterates and organizing various educational / technical programmes to educate them. I will be happy to work for the upliftment of poor and illiterates. I like various programmes being aired on social media that encourage girls and women to come forward and do what men do and which was until now thought to be done by the men only. I would like to work for empowerment of girls/women who can contribute to our society in various ways apart from nurturing their families. 5. Enjoying my hobby of writing : I always thought that I was a good writer which I realized later in my life that I actually am. So given the feeling of freedom from all constraints, I will nourish my hobby of writing and strive towards becoming a full-fledged writer. What would you do if you were #BefikarUmarBhar? Valentine’s Day is all about expressing your love to your loved ones and enjoying with them but it also means that we have to work hard to find our ideal Valentine which is always tough. This year, my wife is away from home and so I felt lonely and very down. I had no one to spend my Valentine’s Day with but here I was fortunate to meet Asus Zenfone which became my ideal Valentine! Here are the top five reasons why the Asus Zenfone is my ideal Valentine. 1) Stylish and classy design- The first impressions are majority times based on the looks. The Zenfone scores here. It is sleek, beautiful and gives a classy feel when you hold it. I was enchanted from the first time I saw it. With its colourful covers, crisp design, the Zenfone catches our eye at first glance. 2) Fairly priced- With its luxurious feel and elegant design, I was afraid that the Zenfone would be too costly for me to buy but I was very surprised when I saw that it started at a very reasonable price of Rs. 5,299! Another pointer in its favour and another reason why the Zenfone is perfect to be my ideal Valentine. 3) Attractive, intuitive and simple UI- The Zenfone features the ZenUI which along with being simple is also intuitive and very functional. It is exclusively designed to function based on our needs and has features like What’s Next, Do It Later, Omlet Chat etc. which make our day-to-day life easy by acting as a helpful companion. Now, all thanks to the Asus Zenfone, I can work and play easy. a)Dual sim facility- With this feature, I can keep two sims in one mobile and balance my work and personal life contacts in one place. b) Latest Android operating system- It comes with Android Jellybean and is upgradable to KitKat which suits me and gives me all the latest features of Android. c) Great memory storage of 8 GB expandable to 64 GB- The memory space is impressive and will help me store all my data in my mobile without the tension of running out of space. d) Long battery life of upto 12 hours on 3G talk time- The battery life is impressive and will help me use the Zenfone without stressing about charging it frequently. i) Amazing sound quality with Asus’ SonicMaster technology- I love listening to music on my mobile and this feature has definitely made me happy. j) Crisp and life like photos with the 5 MP camera infused with Asus’ unique PixelMaster technology which combines five brightness-enhancing lenses to achieve beautiful photos. k) Clear and sharp display on the 4-inch TFT multi-touch capacitive display with 800*480 pixels resolution. l) Protection and better durability is provided with the Soda Lime Glass as the screen- I am often clumsy and have often dropped my mobiles so I am always in terror of breaking something in my mobile and am extra careful when handling it. Thanks to the Zenfone, I can now rest easy. With its sturdy screen, I am in less danger of breaking anything if I drop it by mistake. 5) Attractive offers- On this Valentine’s Day, the Asus Zenfone has brought us the chance to win a trip to Singapore and also hourly prizes of Rs. 1000 vouchers. I haven’t been to Singapore and getting a chance to enter in this contest to win a paid trip, all thanks to my Valentine, is so sweet. So on this Valentine I am so happy that I have found my ideal Valentine, the Asus Zenfone. Checkout the below sweet video and experience #UnconditionalLove with the Zenfone and also checkout the mobile on Flipkart. This post is written for Indi-Happy Hours on IndiBlogger as part of#UnconditionalLove with the Zenfone campaign. 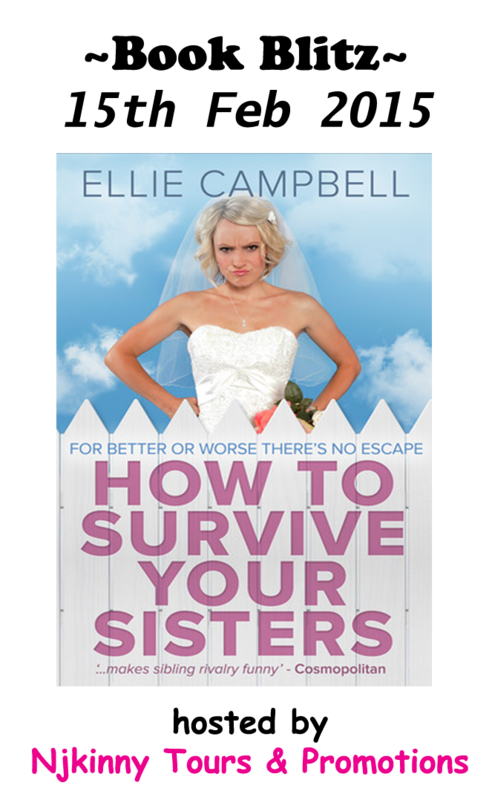 Welcome to my stop for the Book Blitz of How To Survive Your Sisters by Ellie Campbell. This highly rated romance is on sale on Amazon in countries like India, Australia and UK from 3rd Feb to 1st March and Free on Amazon Kindle Unlimited in US! Checkout the book, meet the author and go grab your copy of this "wonderfully warm and witty debut novel about family secrets and sibling rivalry." The four MacLeod sisters are no strangers to sisterly rivalry and with one of them about to be married, there are bound to be fireworks. Perfectionist Natalie wants the 'wedding of the year'. 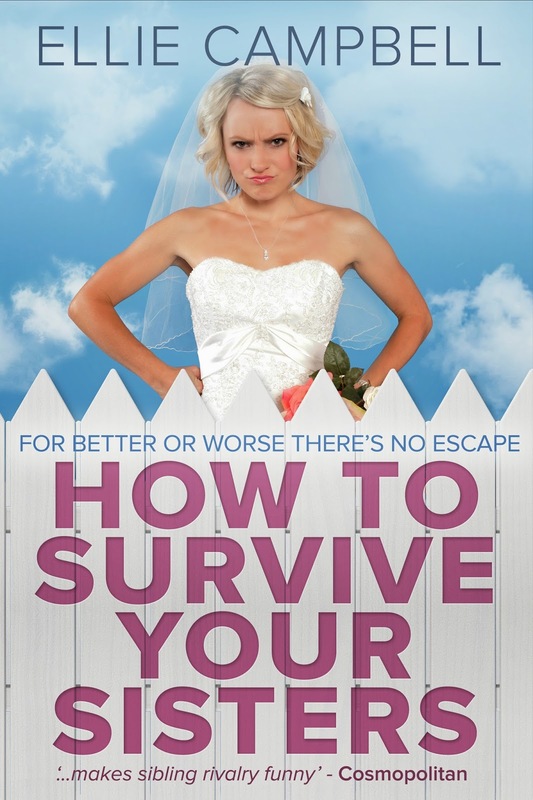 Harassed mother, Milly, just wishes her bridesmaid's dress wasn't the size of a tent. Career-obsessed Avril secretly moons over a married man and world traveler, Hazel, the youngest, yearns to be taken seriously. Forced together for the first time in years, and with an unexpected guest stirring up old resentments, squabbles are inevitable. But when tragedy strikes things really fly apart - as some shocking skeletons emerge rattling from the crowded MacLeod closet..
Ellie Campbell is a pseudonym for sisters, Pam Burks and Lorraine Campbell who collaborate across the mighty Atlantic, finding writing together the perfect excuse for endless phone conversations. They are equally passionate about travel, animals and the great outdoors. Although Pam lives near London, with husband, three children and a dog, while Lorraine is on a Colorado ranch near wild and wonderful Boulder with husband, five horses, five cats, one dog and four chickens – they both believe in enjoying life to the fullest, be it discovering new remote locations or going on trail rides in the beautiful Rocky Mountains. I was painfully shy and in love with this girl with long black hair and shining soulful eyes. We worked in the same office and each day I saw her and fell more and more in love with her. She was intellectual, charming, caring and always jovial. But unlike me she was easy with people while I got uncomfortable with people around me. So it was like we were opposites. Valentine's day was arriving and with that my determination to propose to her was also strengthening. V-day was the perfect day to propose to her and end my agony of not knowing if she loved me or not. But how to go about it? We had never talked. Our interactions were limited to only the occasional "hellos". In order to get this girl, who made my heart skip a beat every time she looked at me, I knew that I had to do something dramatic. So I came up with a plan that hopefully would get my love message to her. I decided on proposing to her in front of the whole office. Everyone knew how shy I was so this was the best way to show her that I truly loved her but also the most difficult thing that I would be doing. My hands shook and sweat beaded my forehead but still I moved towards her cubicle. She was busy working and didn't notice me at first but then she saw me and looking at my sweaty face, asked, "Hey, What are you doing here? Do you need something?" "Did I need something? Hell, yeah...I needed her!" I thought. "Arrr..uhh..no...I mean yes. I need something." I stuttered. nervous disposition and were busy hearing our conversation with interest which made me more nervous but I had to do this. "I need you." I whispered. "Excuse me?" She sounded incredulous and eyed me with one eyebrow raised. I was literally quaking in my shoes but it was now a do-or-die situation so I straightened my shoulders and told her again in the most confident voice I could muster at that moment. "I said that I need you because I LOVE YOU." I told her, all the while aware that the whole office was listening and maybe even betting on the outcome. She had stood by now and I could not make out what she was thinking which somewhat scared me but then all my doubts and fears turned into incredulity when she started laughing. Tears rolled down her cheeks but she still laughed, making me feel stupid and even angry. This was cruelty. She could have rejected my proposal but by laughing she was making fun of my emotions and of me. I could take it no longer and move forward, took her hand in my own, swung her towards me and kissed her soundly. Suddenly, there was complete silence in the office and I realized that I had overstepped a line here. I was beginning to form an apology when she jerked me towards her and kissed me back. "What the hell?" was the first thought in my mind but then all my thoughts were shut down and it was only me and her there. "I LOVE YOU too. Have loved you ever since I saw you. Thank God, you came to your senses and proposed to me or else I would have to do that." She whispered in my ear, leaving me speechless. "She loved me." I thought feeling giddy and on-top-of-the-world. Even the sudden hooting and clapping didn't make me leave her. Here we stood in the middle of the office in each other's embrace. "I LOVE YOU." I spoke loudly to her. "I LOVE HER and SHE LOVES ME!" I shouted as I looked towards my friends and colleagues, wanting to share this great news with them. I was so happy that it seemed like everything was more brighter and suddenly more appealing. The woman I loved, loved me too and our love story was now a reality! That day, I knew that I would do anything to cherish her, love her and support her because finally the time had stood still and there was only the #SoundOfLove with her expressing her love for me and I expressing mine for her! #QuikrNXT ~ The NXT level of selling and buying! I have shopped numerous times on Quikr.com and true to its motto, "No fikar, bech Quikr! ", it has been a true no-tension experience for me but when I heard about Quikr NXT, I was overjoyed. Going a step ahead in its pledge to provide a tension free and an easy to use platform for buying and selling goods, Quikr has launched Quikr NXT which has a chat feature where we can contact the seller or buyer via chat. Exciting, isnt it! 1) Buyers and Sellers can immediately connect with each other through chat across Quikr’s mobile app, mobile site and its desktop site. 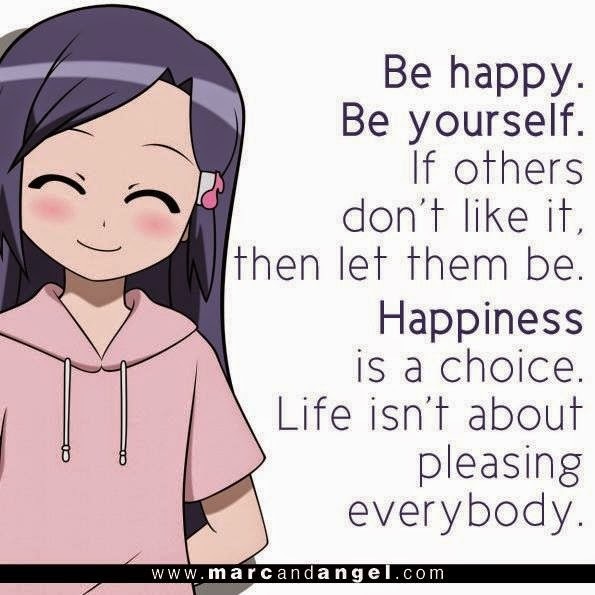 Simple, isnt it! This will help us in having a backup of all our chat history, so we dont have to remember what we talked about. We can always check the history! We can also use the chat as valid proof if the product that we get is not like the one we were promised. Also our money will be saved that was previous spent calling to talk about the product. Chatting is a easier, more convenient and safer method all around. 2) It will enhance online classifieds market due to users able to communicate with each other at their own convenience . It will also facilitate in bringing the e-Commerce to new heights. Often times, we are busy and cant talk on the phone but we can always chat, share the product pics and decide at the best bargain at our own convenience. 3) Users may request more details about the product or service and that too without requiring any phone call. Our phone numbers will remain private and so saved from being misused. 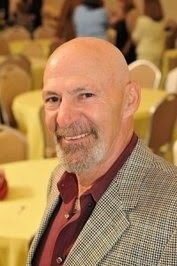 The fake sellers and buyers will be discouraged and we are sure to get more genuine people to do business with. I faced an issue with a fake caller when I tried buying a new phone for myself. It was just a prank for many people but a very disheartening and frustrating experience for me. It takes so much time to select a product that we like and then if we call the seller and he/she proves to be fake then it is so frustrating! So I am ready to accept Quikr NXT with both my hands spread open wide due to the chat feature it is offering and am really very excited about it. Now it is "No fikar, chat Quikr!" and am so happy. Thanks Quikr for blessing all of us with this feature and am confident to receive more such great features from Quikr in the future. This post is written as an entry for Indi-Happy Hours by Indiblogger in association with Quikr NXT.